Everyone has an opinion when it comes to coffee. I too am a bit of a snob and would rather cut myself than drink the burnt, ashy-tasting muck they serve at Starbucks. 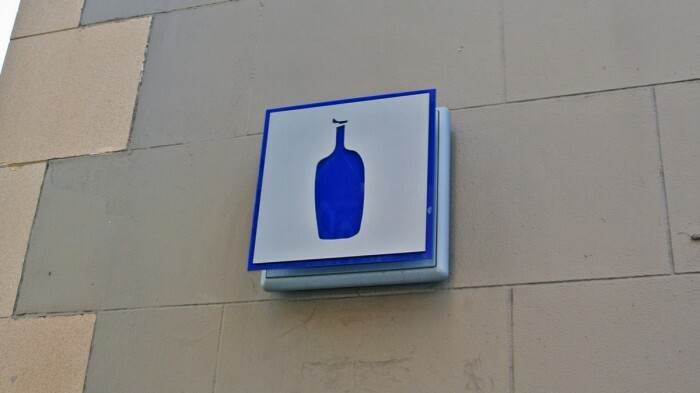 So, the San Francisco and New York based Blue Bottle has been a godsend for me. 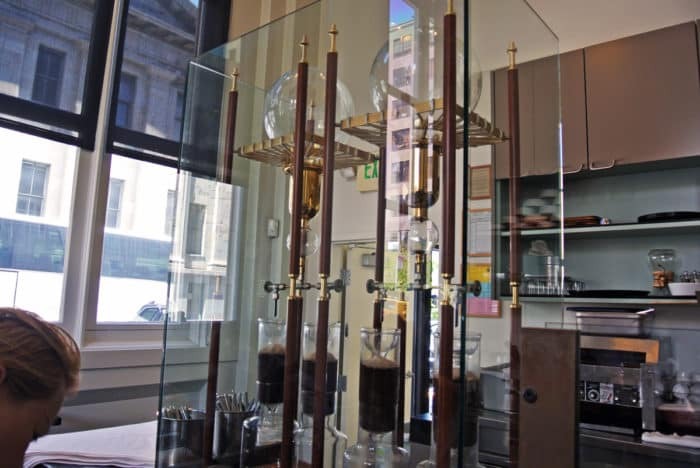 When it comes to coffee, they treat it more as an art and truly more like a science than anywhere else I’ve ever drank the stuff. 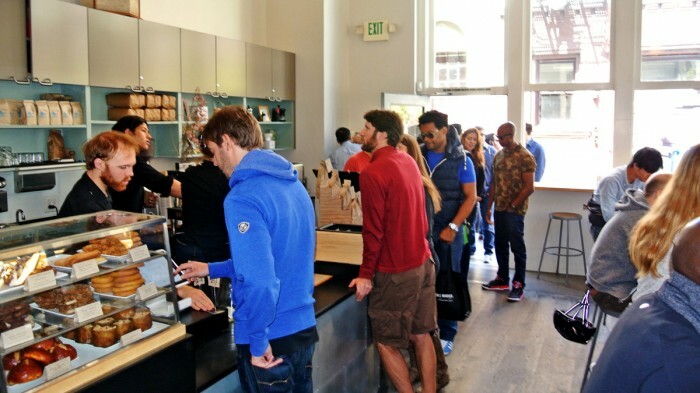 This, of course, draws hoards of mustachioed hipsters who are happy to wait daily in long snaking lines, but Blue Bottle is one of the few places I’m willing to put up with it. Channeling my inner hipster douchebag, I walked over early on a Saturday morning to this nearly hidden coffee shop to indulge in some fancy-schmancy coffee and brunch. Already, the line weaved its way out of the door and into the street, but I persevered. Once I reached the register, I placed my order with the bespectacled, tattooed barista and found myself a seat at the dining bar. I grabbed a barstool right in front of the coffee brewing station so I could enjoy the brewing show while I waited for my food and beverage to be prepared. 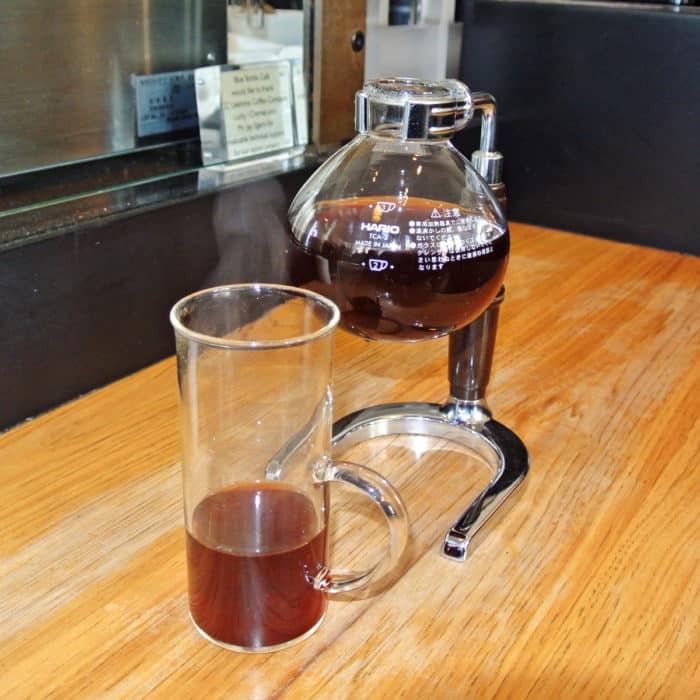 I had decided to splurge on a pot of coffee using a particularly intensive brewing process called siphon brewing involving special coffee beans called La Cañada Cup of Excellence. This particular brew was described on their menu as having notes of blackberry, dark cherry, cinnamon, and orange. We shall see what kind of coffee this molecular gastronomy produces. 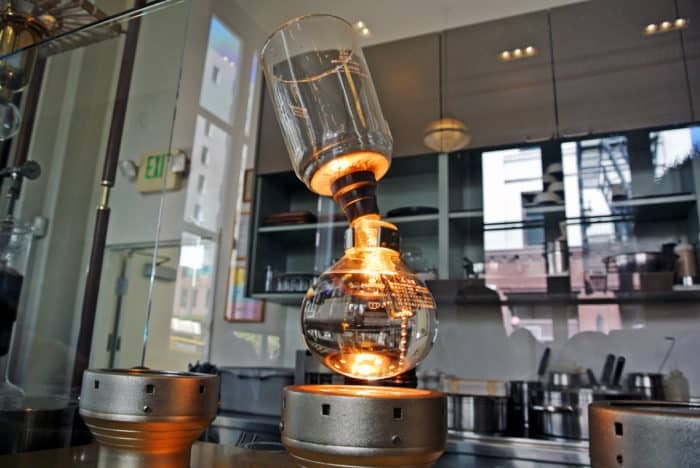 First, the barista set up a glass orb-shaped beaker in a clamp/stand contraption and placed the glass bulb over a brightly glowing heat lamp. He then placed a large open-topped, cylindrical glass over the orb with a glass piece poking down into the water-filled bulb below. 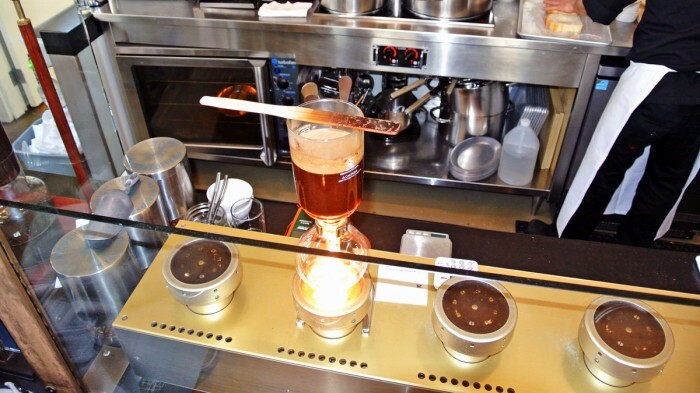 Through the brewing technique known as siphoning, the water in the bulb sucked itself up into top glass where the barista then poured in a freshly fine-ground coffee powder and stirred it with a wood stick. 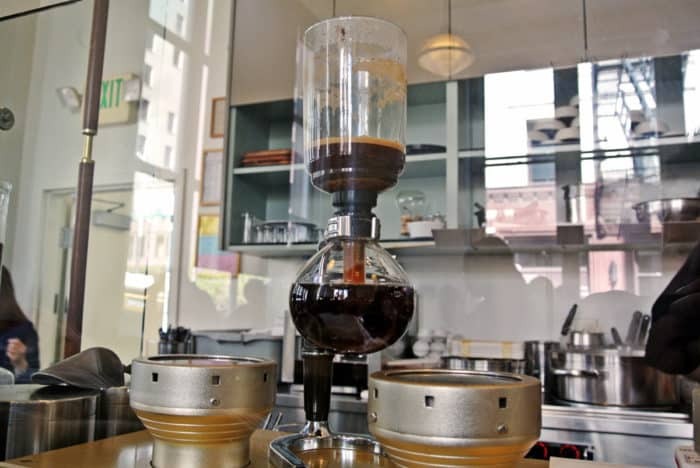 This process took a few carefully timed minutes before it was fully brewed and could be drained back into the bulb below as completely brewed coffee. This was finally presented to me with a warning to wait three or four minutes while the coffee cooled off so as not to scald my mouth. I was instructed to smell the coffee’s complex odors like a fine wine. After letting it cool off for a few minutes and allowing the gentle aromas waft into my nasal passage (now I’m intentionally sounding like a douchebag), I took a sip from my ridiculous looking glassware. This was certainly great coffee, but I hate to say it, I didn’t taste much of a difference between this brew and their standard pour-overs. And really, the coffee’s flavor was quite a bit milder than I had expected and hoped for. Nonetheless, it was good coffee and quite a fascinating performance to watch it being made, but I wouldn’t necessarily wait for it again. But I wasn’t only here for coffee. 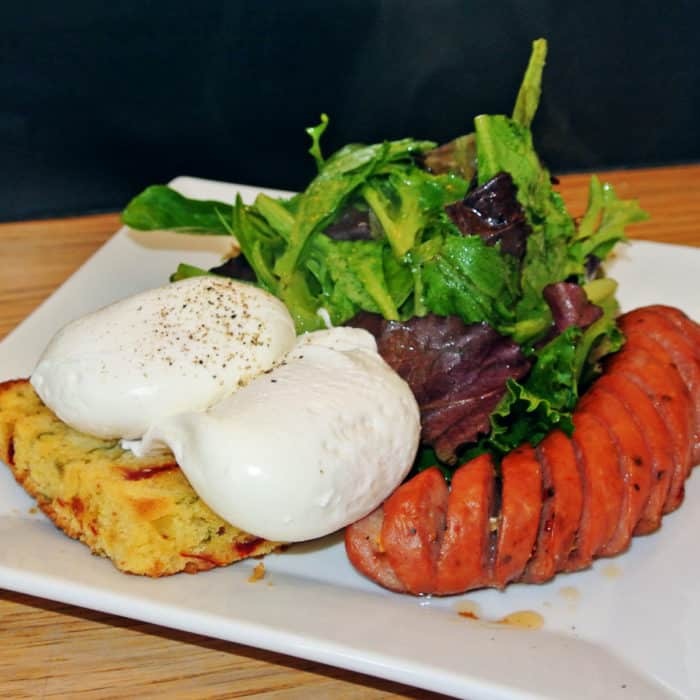 For my brunch, I ordered Poached Eggs served over Piquillo Pepper Corn Bread with Prather Ranch Hot Italian Sausage and a County Line Baby Greens salad. The salad was actually great and I don’t often say that about salads. The mixed greens came tossed in a bright, citrusy dressing that bursted with the kind of bold, refreshing flavors I often enjoy. The sausage was also quite good and was snappy, meaty, and spicy and paired really well with the rest of the plate. The crumbly corn bread served its purpose as a thick, crispy surface to soak up that runny poached egg yolk well too. All in all it was a pretty excellent brunch plate and one that I don’t think would cross peoples’ minds when planning for a brunch meal. 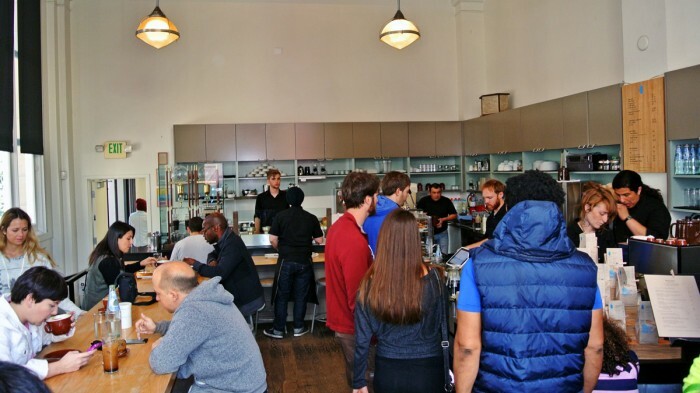 So if you love great coffee, want flavorful, well-made brunch food, and can stomach the line and hipster attitude, give Blue Bottle a go. 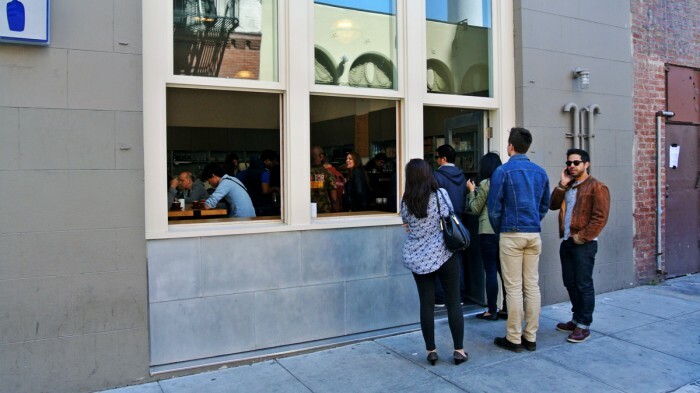 Got another spot I should check out to get my caffeine fix and brunch fill? Let me know in the comments below.